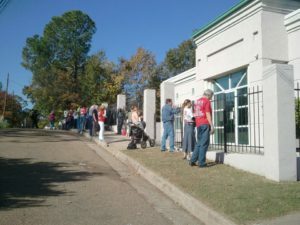 NEW ORLEANS — A federal appeals court has struck down a Mississippi law that would have closed the last remaining abortion facility in the state. While Judge Stephen A. Higginson, nominated by Barack Obama, concurred, Judge Emilio M. Garza wrote a dissent in which he disagreed that states are required to possess operating abortion facilities. “Absent any evidence and factual findings on the Act’s impact on costs and travel distances for accessing abortion services, JWHO has failed to demonstrate a substantial likelihood of proving a constitutional violation,” Garza concluded. On Monday, Chet Gallagher, a 65-year-old retired police officer, was ordered by a separate criminal court not to have any contact with Jackson Women’s Health Organization after he was convicted of “obstructing a business” for walking up and down the public sidewalk while reading the Bible outside of the facility. Harriet Ashley, an 82-year-old great grandmother, was likewise ordered not to go near the abortion facility after she was declared guilty of obstruction and disorderly conduct for reading her Bible while sitting in a chair on the public sidewalk.